Students at UNE in Biddeford are enjoying a beautiful and beneficial wall of green, made up of 960 plants, the living wall is not only purifying the air but also helping students keep their calm. BIDDEFORD (NEWS CENTER Maine) — Across the state buds are sprouting and the earth is thawing into a warm green landscape. It is finally spring in Maine and that means anyone with a pulse is itching to be outdoors. But for students at the University of New England, the outdoors are coming into them. Plantwerks recently installed one of the largest living walls at the new Student Commons Building in Biddeford. In an almost quilted design, 960 plants cascade 400 square feet down a large wall in the middle of the student center. The vibrant design of green plants is made up of five different varieties of tropical shrubs. Lynn Petty is an interior landscape designer for the Salisbury, Massachusetts-based business. Petty says the installment at UNE is one of the largest in Maine and the first at a college or university for the company. 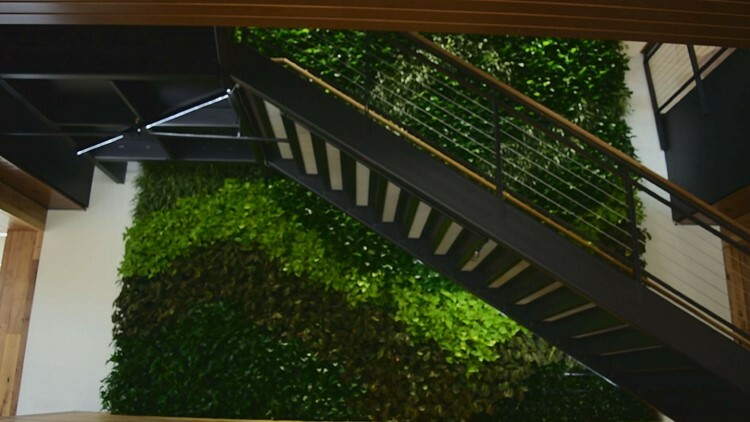 The company installs the living walls primarily in businesses and in both old and new buildings. The plants are great for air quality, Petty says, as they purify the air but they do so much more. 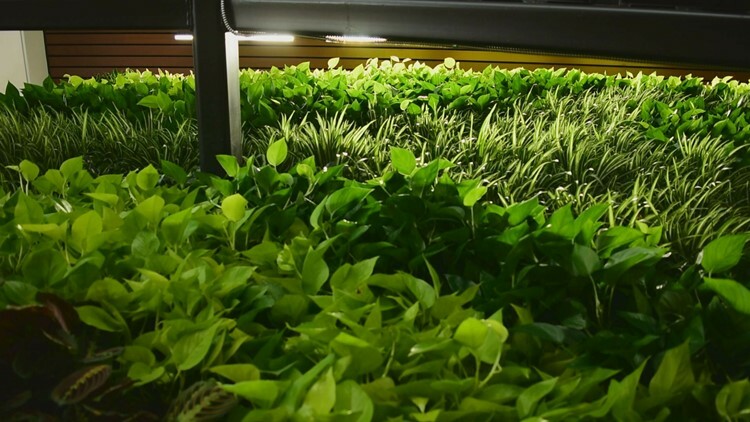 “So we're finding that [the plants] increase productivity, it will help the students study, it will help them relax, it will rejuvenate them and calm them," Petty says. Living wall at UNE in Biddeford is made up of 960 plants. Petty says there are a lot of studies that show the advantages of biophilic design. Biophilia is the idea that our mental and physical well being is directly tied to our connection with nature, light, and vegetation. While the students might not know too much about it, they seem to be enjoying the plant wall, even nicknaming it the "breathing wall." Chris Spino is a freshman from New Jersey. He says he thought the plants were artificial the first time he saw them. “With all the plant life in here, it brings more of the outside, relaxing feel so you're not just looking at walls and windows and just chairs. It brings more of a homey feel like you are outside relaxing with your friends,” Spino says. Evan Carrell, sophomore, was studying near the "breathing wall" Friday afternoon when we stop to chat with her. “It is definitely a beautiful addition to the campus, it brings this new building to life and it is a great appeal when you walk through the doors,” Carrell says. There is a trend in the U.S. toward an emphasis on wellness built environments and Petty says its exciting because people are beginning to understand that plants are not just "aesthetically pleasing but really beneficial." UNE officials say they hope to get students involved with maintaining the wall and applying their fields of study to it in the future. But for now, the wall serves as a reminder to students to stay calm and smell the plants.